Better Food Stories | There are some amazing and delicious aspects of the modern food supply that shouldn't be taken for granted. This blog was established to tell the stories of the people and innovations that are behind many of our favorite foods. We will talk about a wide variety of technologies and explain why and how farmers use them for our benefit. In the spring of 1980 I was walking through a research vineyard on the property of the University of California at Davis. At the time I was a graduate student in the department of Plant Pathology, studying the diseases of plants. I worked in the lab of Dr. Mary Ann Sall who had responsibility to do research on the diseases of grapes – a very important crop in California and the crop that was my introduction to agriculture. That particular morning the grapes happened to be in bloom. 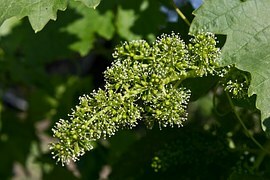 Bloom time in grapes is not very dramatic. Grapes don’t have any petals on their flowers since they don’t need to attract pollinators. They simply self-pollinate in the process of the flower opening or with a little wind. However, what struck me on that spring morning was that there was a very pleasant fragrance wafting around in that vineyard. Since this was my fourth season of being in vineyards during bloom I wondered why I had never “smelled the flowers” before. Then I realized what was going on. This particular vineyard had not been dusted or sprayed with sulfur, the normal protection against a disease called powdery mildew. Instead my boss was using these vines to test a brand new fungicide called Bayleton. Bayleton is a synthetic chemical that affects an enzyme in a pathway that exists in fungi, but not in plants or animals (Triazole fungicides, effecting Ergosterol Biosynthesis). Dr. Sall was testing it as a new alternative to protect grapes from one of their most troublesome pests – a fungal disease called powdery mildew. Because of this new alternative to sulfur, I was able to experience a floral fragrance that was different from all my other spring, vineyard experiences. Grapes grown in a dry, Mediterranean climate like California are spared some of the most problematic diseases that occur in rainier places like France and Germany. However, the powdery mildew fungus can infect even without any rain. If you have grown roses you have probably seen the type of powdery mildew that attacks that garden favorite, and there are powdery mildews specific to a great many other wild and cultivated plants. Probably since ancient times, people have known that you can prevent powdery mildew damage on grapes by dusting them with the element, sulfur. Sulfur, which can be mined, is considered to be a “natural product” and thus it is approved for use in organic. 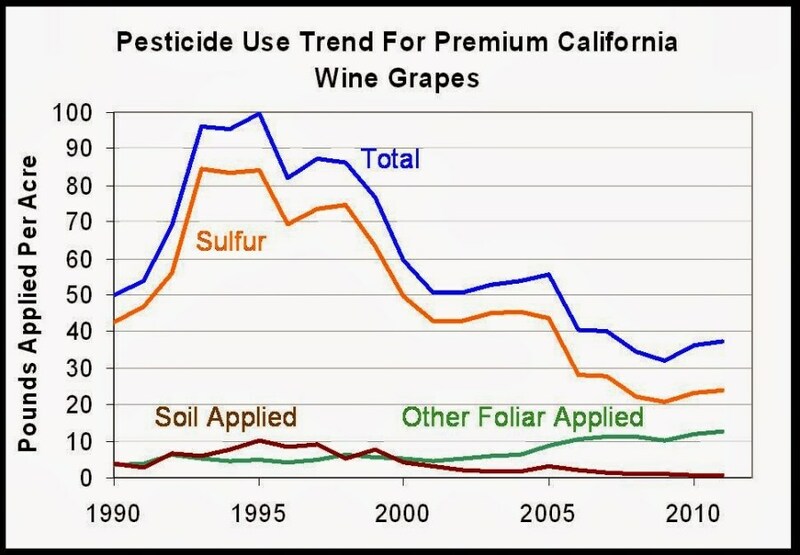 Both conventional and organic farmers use a great deal of sulfur – it is by far the most widely used pesticide in California and particularly for grapes. Back in 1980 is was common for vineyards to be dusted with 6-10 pounds per acre of sulfur as frequently as every 7-10 days from the time the grapes start growing until they begin to ripen. The sulfur was necessary to prevent mildew infections, which are very bad for wine quality or for the quality of table grapes or raisin grapes. Even though the sulfur is “natural” and good for controlling both mildew and spider mites, it isn’t a pleasant thing to be around when you are out working in a vineyard. It is irritating to one’s eyes and skin. I always had to keep my vineyard clothes separate from all the other laundry or it would all end up smelling like sulfur. Back to the new fungicide – it turned out that with Bayleton, grapes growers could control mildew using a far lower dose than sulfur and do so only once every three weeks, not every week. When the product became available, it was enthusiastically adopted by the grape growers as a far better option than sulfur. Unfortunately the switch was too popular and in time strains of grape powdery mildew arose which were resistant to that fungicide. Fortunately newer compounds in the same “chemical family” were developed which overcame that issue, and in subsequent years several other good mildew fungicides have been developed with a different “mode of action.” Sulfur is now playing a much smaller role in modern, “integrated pest management” programs in grapes that rotate different kinds of products through the season so that the fungus doesn’t become resistant to any of them. All of these changes have been quite positive for grape quality, farm worker (and graduate student) comfort, and for the environment since much less fuel is used for applications than it was back in the day when sulfur was the only option. That rare chance I had to smell the grape flowers back in 1980 still resonates with me as a symbol of the steady progress in pest management throughout my career. The next time that you are enjoying a nice wine, you might also raise a glass to this example of progress in the art of crop protection. A few weeks ago I flew to Pasco, Washington and then drove up to Yakima. Eastern Washington is a very dry region, but it has several major rivers and the Columbia Basin Reclamation Project that allow for a flourishing and diverse agricultural industry. My progress was slowed by an irresistible urge to continually exit the main highway to take pictures of these carefully tended crops and to see some of the on-going innovation in planting systems. Tree fruits like apples, pears and cherries have long been important to this region. It was fascinating so see some of the innovation used to grow these crops. The image above is from a more classic orchard where large trees are grown with fairly wide spacing between trees and with large swaths between the rows. The next image shows a newer style orchard, in which trees are planted at high density along the row (every 18” or so), and supported by a trellis. This system gets the trees into full bearing within 2-3 years and can be harvested without the use of ladders (a worker safety and efficiency advantage). The space between the rows is also narrower requiring smaller equipment in terms of tractors, sprayers etc. Note that weeds are controlled in the row with herbicides for water efficiency, and the “middles” support a diverse “cover crop” which stabilizes and feeds the soil. In the photo above we see a different trellising strategy. In this case, the high density trees are trained in a “V” shape with the goal of even more efficiently capturing the sunlight. Driving further down the road I saw something unusual in the distance and decided to investigate. It turned out to be another high-density, trellised apple orchard, but in this case it was being grown under a shade cloth to filter the light. This would reduce the chance of fruit getting a “sunburn”, and as you can see, this orchard had an abundant crop of picture-perfect fruit nearing maturity. Hops, a highly aromatic plant, have been grown in this region since the 1870s, but even more so of late to meet demand for the booming craft beer industry. Hops are a vine which is trained on very tall (20’ or more) trellises. It is quite impressive to see! From the side of the field (below) it is a giant green wall. Washington state is home to a flourishing grape industry with many excellent offerings for wine aficionados. It has also been a long-term source of juice grapes, which is what you see in the vineyard below. Note again the clean vine-row and the cover crop in the “middles.” This is the best way to use water efficiently, build soil quality, and prevent erosion on these hilly locations. Eastern Washington is also home to many other crops. I’ll just throw in two more examples of an alfalfa field and a sweet corn field. The next day I had the privilege to spend time with a number of representatives of the grower organizations and others that support these Washington farmers. The meeting was organized by the Washington Friends of Farms and Forests, which is a grass roots alliance of those who grow the crops or tend the timberlands. I’ll be working with many of these folks for the next few months documenting some of their challenges and strategies tending these diverse plant species for the benefit of the broader society. As always, it was great to see real farming in action! There is a term in the wine grape industry called “terrior” which celebrates the fact that fruit quality for wine making is greatly influenced by cultivar, climate and soil type. Year-to-year differences in weather further influence the quality of specific “vintages.” Wheat may be a humbler crop, but it is like wine in the sense that there are different classes of wheat for different end-use products and there are different regions where each type excels based on climate (wheat can be hard or soft, spring or winter, red or white, and there is a separate type called “durum” for pasta). There are even year-to-year differences in quality. For instance, to make an artisan bread, it is best to use flour from hard red spring wheat, that comes from the northern plains (North Dakota, Minnesota) or from the prairie provinces of Canada (e.g. Alberta and Saskatchewan). For Asian noodles one wants a soft white winter wheat from the Pacific Northwest. For crackers a soft red winter wheat is best from a place like Southern Illinois or Kentucky. For pasta, a distinct type of wheat called durum is used and this is grown in Arizona and in the northern plains. There are several important measures of wheat quality that reflect important properties of the dough, like strength and elasticity. These properties drive features, like how well the dough will rise and balance of different classes of starch, which influence the texture of baked products. A yearly report on U.S. hard red spring wheat examines eight categories of “grading” data and eleven measure of “kernel quality.” 53% of U.S. wheat and 60% of Canadian wheat are exported around the world and purchased by customers looking for specific qualities (based on FAOStats data 2011-13). Europe is a major producer of wheat and has much higher wheat yields compared to the lower rainfall production areas in North America, but European countries still import a great deal of wheat for high quality bread and pasta and use much of their domestic production for animal feed. As with all crops, wheat is attacked by various pests. Unlike grapes, it is possible to deal with some of the pests by breeding resistant varieties of wheat (winemakers are reluctant to accept new grape varieties preferring the traditional favorites that have been in use for hundreds of years). A key advance in the “Green Revolution” of the 1960s was developing resistance to a particularly damaging fungal disease called “Stem Rust.” That resistance held up for decades, but in 1999 a strain of the fungus overcame the trait, and since then wheat breeders worldwide have worked to breed a new resistance gene into all the different genetic backgrounds for the diverse wheats grown around the world. In wet climates, wheat can be infected by many different fungal pathogens and commercial production requires the use of several protective fungicide treatments, starting with seed treatments and spaced throughout the growing season. In drier North America, diseases are not as problematic, but do sometimes require treatments to preserve yield and quality. If it rains during the time when the wheat is flowering, a fungus called Fusarium can infect the crop and wheat has proven to be very difficult to breed for resistance. A well timed fungicide spray can help against this disease, but that is not always possible. This particular fungus can produce a mycotoxin chemical in infected wheat kernels called Deoxynivalenol or DON. It is also called “vomitoxin” because of the effect it has on animals that consume contaminated grain. In our food system, the consumer is well protected from exposure to such toxins, thanks to the care and expense taken on by farmers. The global wheat industry is really made up of many distinct sub-crops, but as a whole, wheat production has been making steady progress in keeping up with growing global demand with only minimal expansion in planted areas (see graph below). Some of that progress has been made by diminishing pest damage through a combination of breeding and crop protection agents like fungicides. Also, a great deal of modern wheat production is in “no-till” systems where weeds are controlled with herbicides instead of by mechanical tillage. This system greatly reduces soil erosion, lowers fuel use and leads to improved soil health and carbon sequestration. So the next time that you enjoy a wheat-based product, think about the effort and risk that a wheat farmer faced, not only to produce the grain, but to produce it with the positive qualities needed and with the absence of issues like DON toxin.